UK mobile operator EE has revealed the recent football match between England and Wales delivered a new record for mobile data consumption on its network. The Euro 2016 fixture was the first time the two countries had faced each other in one of the big two international football tournaments. The match kicked off at 2pm, which probably coincided with a belated lunch-hour for many fans. It was broadcast by the BBC and also streamed live via the BBC website, which will have prompted many fans to watch it on mobile devices. 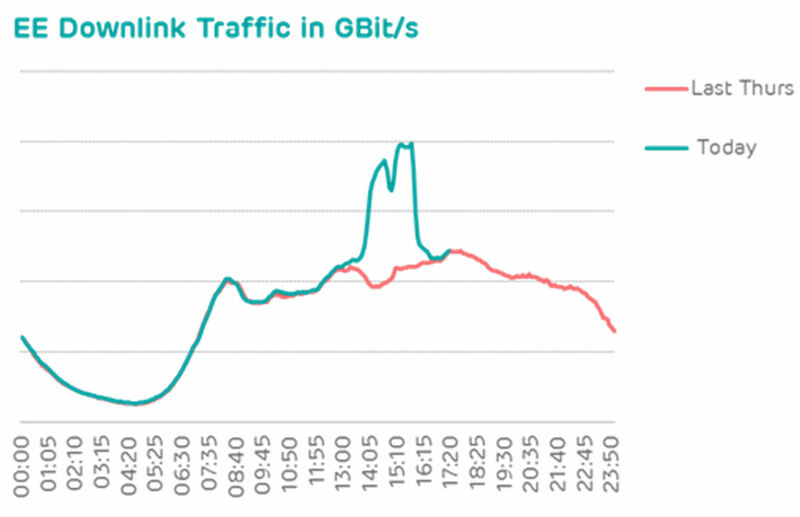 The chart below shows yesterday’s data traffic superimposed on the data for a week ago. As you can see the traffic curves were almost identical until 2pm, at which point mobile data consumption almost doubled. A few people stopped streaming at half time then even more tuned in for the second half, peaking when Daniel Strurridge scored England’s late winner before quickly dropping back to normal levels. According to EE that peak was 50% higher than the previous peak, which resulted from people streaming footage of Tim Cahill’s volleyed goal for Australia against the Netherlands in the 2014 World Cup, which you can see below. EE also shared an update to its Wembley Stadium mobile data consumption numbers. Apparently this year’s FA Cup final topped one terabyte of mobile data in the stadium, almost double last year’s level. Here’s some more info from EE: “The magic of the cup final fuelled a surge in picture and video posts to social media with uploads representing 31% of total traffic inside the stadium, a significant increase from previous events. Usage of Snapchat peaked at the start of the first half, as lucky fans from both sides looked to share their big day out with friends and family. “Web browsing and video streaming made up the vast majority of data downloads during match day, with fans utilising access to video replays and match feeds via the likes of BBC Sport.